According to a new research report at RnRMarketResearch.com, total demand for water treatment equipment in the United States is expected to grow 6.0 percent yearly through 2017, with gains expected in every major market. E. Bridgewater, MA, August 5, 2013 – Process and Water Company, a leading manufacturer and designer of advanced water purification, filtration and chemical treatment systems, today announced that it developed and suppliea unique, rooftop rainwater reclamation and reuse system to the U.S. Marine Corps for its Bachelor Enlisted Quarters at Marine Corps Air Station Cherry Point. The innovative and environmentally-friendly system contributed to the facility earning a Leadership in Energy and Environmental Design (LEED) Gold certification from the U.S. Green Building Council. Process and Water worked closely on the system’s design and deployment with Haskell, a top integrated design-build firm and project lead for the new facility, and its subcontractors. The Process and Water system ‘harvests’ rainwater by collecting it from the roofs of each of the facility’s building and centrally storing it. After it is collected, the water is sent through a storm filter that removes organic debris such as fallen leaves, and then transferred into a 10,000-gallon underground storage tank. After the tank reaches capacity, any additional rainwater is handled by an overflow system that is tied into the project’s storm drain system. The system pumps the previously filtered rainwater through a specialized micron filter subsystem, and then sends it to a 500-gallon day tank. There, another pump constantly cycles the water through a UV sterilization system which yields bacteria-free water. The twice filtered and UV-sterilized water is utilized to flush toilets and for a variety of other non-potable uses throughout the facility. The Process and Water rainwater harvesting system has helped the facility to reduce its water use by 40% compared to a building with traditional water systems. 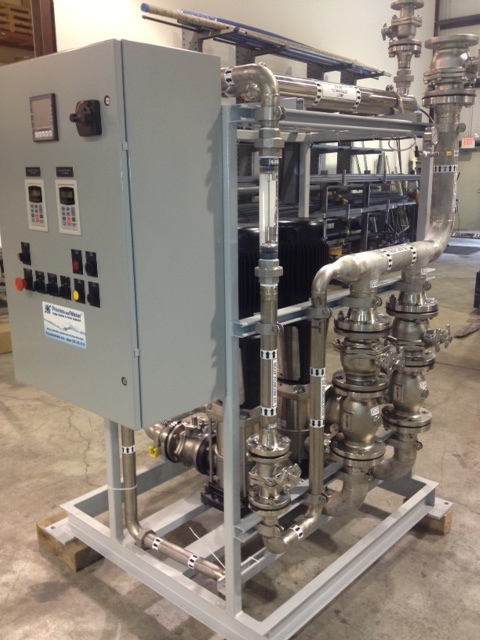 Process and Water is a different kind of water purification and fluid-handling system company. It offers the high-end and custom systems customers expect from large companies, but with the personalized support and services that only smaller companies can deliver. Providing innovative system design, development and manufacturing, Process and Water Company specializes in creating systems that not only meet customers’ specific operational needs, but also their budget requirements. The company’s expert staff partners closely with customers in all phases of their projects, and offers preventative maintenance and technical support services that ensure uninterrupted operations. Big company capacities delivered with small company care – that’s the Process and Water difference. Founded in 2010, and headquartered in East Bridgewater, Mass., Process and Water is a subsidiary of Elevate Experts Corp., a provider of strategy and management services to small- and mid-sized businesses. EPA Announces Small Business Innovative Research (SBIR) Program Funding Opportunity. The US EPA has announced a funding opportunity through its Small Business Innovative Research (SBIR) program. In Phase I of the program, there are 24 awards of $100,000 each for small businesses (fewer than 500 employees) for research or research and development (R&D) to meet stated agency technology needs or missions. These technology needs include the following topics: Safe and Sustainable Water Resources (Topic A – Water); Chemical Safety for Sustainability (Topic B – Innovation in Manufacturing); Sustainable and Healthy Communities (Topic C – Waste); Air/Climate/Energy (Topic D – Air Quality); Homeland Security (Topic E); and People, Prosperity and the Planet (P3) special funding opportunity (Topic F). The deadline for applications is July 17, 2013. Any questions on this solicitation should be directed to Judy Ancharski, Contract Specialist at ancharski.judy@epa.gov or Marsha Johnson, Contracting Officer at johnson.marsha@epa.gov. You can also contact John Raschko from OTA at (617) 626-1093 to discuss potential projects.